Birdman of Alcatraz, that is Robert Stroud, was in the slam for 54 years, from 1909 until his death in 1963. Stroud murdered two people; he assaulted more, become known as a “wolf” (sexual predator of other convicts), and was declared psychopathic: in short, anything but swell. Aside from being more than a bit anti-social, Stroud also raised and studied thousands of birds during his decades in stir, wrote books about them, became famous—a cause celebre for people concerned about the inequity of the penal system. A good source for information on avian life, and a good person to keep on the other side of a tall stone wall, Stroud’s story was tailor-made for a movie, and director John Frankenheimer’s 1962 saga is a damn good one. Sure, it’s candy-coated (he’s just a hard-case), and a lot gets conveniently compressed, overlooked or just plain tossed, but the result is 147 minutes of Hollywood liberal mythmaking at its best. Burt Lancaster gives one of his finest performances as Stroud; he’s backed up with a superior team—Karl Malden, Thelma Ritter, Neville Brand, Telly Savalas, Betty Field, Edmond O’Brien. Burt, Thelma, Telly and the cinematography were all Oscar nominated. For the wonderful Ritter, this was her last of six Supporting Actress nominations, as Stroud’s controlling mother. Relative newcomer Savalas (quite an interesting person in real life) got a big career boost, at 39, with his nod as Burt’s cellblock pal with a soft spot for canaries. Cameraman Burnett Guffey did a lot of great work in black & white (snagging an Oscar for From Here To Eternity, as well as one for his rich color work on Bonnie and Clyde), and his compositions here superbly convey the isolation that on most reduces personality, but in some few manages to bring inner strengths to the surface–maybe the ultimate example could be Nelson Mandela: in this case it was a thug finding something to care for and about. Lancaster’s physical presence of coiled power, and suppressed anger, along with his calm and deliberately modulated voice, colored by the actors liberal sympathies, make a perfect fit for the scripts take on Stroud. * Too bad there was so much competition that year–O’Toole in ‘Lawrence‘, Lemmon in Days of Wine and Roses, Peck winning for ‘Mockingbird‘. This was one of five teamings the actor had with the director. Veteran tough-guy Neville Brand scored one of his best parts, sympathetic for a change, as a gruff but humane Leavenworth prison guard who ages along with Stroud. Elmer Bernstein did the sensitive score. With Hugh Marlowe, Whit Bissell, James Westerfield and Nick Dennis. Coming in 33rd among the hits of a packed year, grossing $7,600,000, it’s one of the classic where-is-the-humanity? 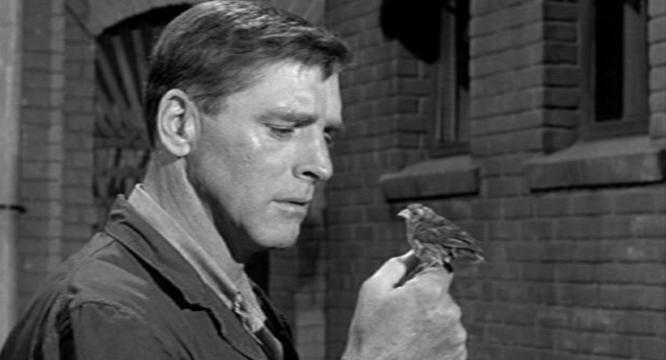 movies of its decade, and still powerful: just remember to forget that Bob Stroud was nice to birds in direct proportion to his viciousness to humans.